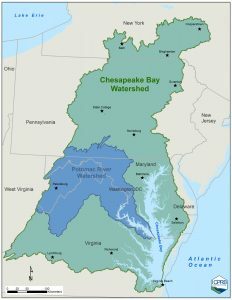 The 2014 Chesapeake Bay Watershed Agreement contains ten goals intended to advance the restoration and protection of the Bay watershed. Each goal has a set of outcomes, with measurable targets, that will directly contribute to its achievement. Over a 12-month period following the signing of the Agreement, the Bay Program partner agencies, with input from the public, developed Management Strategies to achieve the Goals and Outcomes. ICPRB has participated in the Chesapeake Bay Program since the 1980s through staff participation and leadership in multiple committees, workgroups, and task forces, and through special projects on a variety of issues. ICPRB is currently involved in Bay Program-related activities that directly relate to the selected Goals/Outcomes shown below. For these Goals and Outcomes, ICPRB intends to participate in the development of the Management Strategies and subsequently contribute to the Goal/Outcome. GOAL: Protect, restore and enhance finfish, shellfish, and other living resources, their habitats and ecological relationships to sustain all fisheries and provide for a balanced ecosystem in the watershed and Bay. Forage Fish Outcome: Continually improve the Partnership’s capacity to understand the role of forage fish populations in the Chesapeake Bay. By 2016, develop a strategy for assessing the forage fish base available as food for predatory species in the Chesapeake Bay. American shad was at one time a major forage fish in the Bay ecosystem and ICPRB will urge that it be taken into consideration in the management strategy. GOAL: Restore, enhance, and protect a network of land and water habitats to support fish and wildlife, and to afford other public benefits, including water quality, recreational uses and scenic value across the watershed. Stream Health Outcome: Continually improve stream health and function throughout the watershed. Improve health and function of ten percent of stream miles above the 2008 baseline for the Chesapeake Bay watershed. The Stream Health Management Strategy developed in 2015 identified the Chessie BIBI as the CBP indicator for tracking progress in meeting the Stream Health goal. That goal is: “Continually improve stream health and function throughout the watershed. Improve health and function of 10 percent of stream miles above the 2008 baseline for the Chesapeake Bay watershed.” In developing the strategy, it was recognized that the Chessie BIBI was the only measure of stream biological health that is designed to work across the entire Chesapeake watershed. It was possible to develop the Chessie BIBI because all the states, as well as several counties and volunteer organizations, collect macroinvertebrate samples and do it in a fairly comparable manner. Other stream health indicators – chemical and physical – are likely to be developed in the future and could eventually be used to measure progress along with the Chessie BIBI. Fish Passage Outcome: Continually increase available habitat to support sustainable migratory fish populations in Chesapeake Bay freshwater rivers and streams. By 2025, restore historical fish migratory routes by opening 1,000 additional stream miles, with restoration success indicated by the consistent presence of alewife, blueback herring, American shad, hickory shad, American eel and brook trout, to be monitored in accordance with available agency resources and collaboratively developed methods. ICPRB was involved in developing the American shad population indicator and we will recommend the continued use of that indicator. GOAL: Reduce pollutants to achieve the water quality necessary to support the aquatic living resources of the Bay and its tributaries and protect human health. 2017 Watershed Implementation Plans (WIP) Outcome: By 2017, have practices and controls in place that are expected to achieve 60 percent of the nutrient and sediment pollution load reductions necessary to achieve applicable water quality standards compared to 2009 levels. ICPRB currently is involved in the development of the Phase 6 Watershed Model which will be used to calculate the load reductions expected from practices and controls in place. There may be opportunities to assist local governments to develop their WIPs, using our familiarity with CBP methods for assigning load reductions to BMP practices. 2025 WIP Outcome: By 2025, have all practices and controls installed to achieve the Bay’s dissolved oxygen, water clarity/submerged aquatic vegetation and chlorophyll a standards as articulated in the Chesapeake Bay TMDL document. The same ICPRB role for this Outcome as for the 2017 WIP Outcome. Water Quality Standards Attainment and Monitoring Outcome: Continually improve the capacity to monitor and assess the effects of management actions being undertaken to implement the Bay TMDL and improve water quality. Use the monitoring results to report annually to the public on progress made in attaining established Bay water quality standards and trends in reducing nutrients and sediment in the watershed. ICPRB currently is involved in building and maintaining the monitoring databases at CBP, has considerable expertise in analyzing those data, and might have a role in communicating progress to the public. GOAL: Increase the number and the diversity of local citizen stewards and local governments that actively support and carry out the conservation and restoration activities that achieve healthy local streams, rivers and a vibrant Chesapeake Bay. Citizen Stewardship Outcome: Increase the number and diversity of trained and mobilized citizen volunteers with the knowledge and skills needed to enhance the health of their local watersheds. ICPRB’s workshops and internet-based information products should support this outcome. Local Leadership Outcome: Continually increase the knowledge and capacity of local officials on issues related to water resources and in the implementation of economic and policy incentives that will support local conservation actions. ICPRB’s internet-based information products should support this outcome. GOAL: Expand public access to the Bay and its tributaries through existing and new local, state and federal parks, refuges, reserves, trails, and partner sites. GOAL: Enable every student in the region to graduate with the knowledge and skills to act responsibly to protect and restore their local watershed. Student Outcome: Continually increase students’ age-appropriate understanding of the watershed through participation in teacher-supported, meaningful watershed educational experiences and rigorous, inquiry-based instruction, with a target of at least one meaningful watershed educational experience (MWEE) in elementary, middle and high school depending on available resources. ICPRB’s teacher training workshops directly support this outcome. ICPRB green school workshops and related activities directly support this outcome.